Einhard, the friend and biographer of Charlemagne; he is also called Einhartus, Ainhardus or Heinhardus, in some of the early manuscripts. About the 10th century the name was altered into Agenardus, and then to Eginhardus, or Eginhartus, but, although these variations were largely used in the English and French languages, the form Einhardus, or Einhartus, is unquestionably the right one. According to the statement of Walafrid Strabo, Einhard was born in the district which is watered by the river Main, and his birth has been fixed at about 770. His parents were of noble birth, and were probably named Einhart and Engilfrit; and their son was educated in the monastery of Fulda, where he was certainly residing in 788 and in 791. Owing to his intelligence and ability he was transferred, not later than 796, from Fulda to the palace of Charlemagne by abbot Baugulf; and he soon became very intimate with the king and his family, and undertook various important duties, one writer calling him domesticus palatii regalis. He was a member of the group of scholars who gathered around Charlemagne, and was entrusted with the charge of the public buildings, receiving, according to a fashion then prevalent, the scriptural name of Bezaleel (Exodus 31:2 and 35:30-35) owing to his artistic skill. It has been supposed that he was responsible for the erection of the basilica at Aix-la-Chapelle, where he resided with the emperor, and the other buildings mentioned in chapter XVII of his Vita Karoli Magni, but there is no express statement to this effect. In 806 Charlemagne sent him to Rome to obtain the signature of Pope Leo III to a will which he had made concerning the division of his empire; and it was possibly owing to Einhard's influence that in 813, after the death of his two elder sons, the emperor made his remaining son, Louis, a partner with himself in the imperial dignity. When Louis became sole emperor in 814 he retained his father's minister in his former position; then in 817 made him tutor to his son, Lothair, afterwards the emperor Lothair I; and showed him many other marks of favor. Einhard married Emma, or Imma, a sister of Bernharius, bishop of Worms, and a tradition of the 12th century represented this lady as a daughter of Charlemagne, and invented a romantic story with regard to the courtship which deserves to be noticed as it frequently appears in literature. Einhard is said to have visited the emperor's daughter regularly and secretly, and on one occasion a fall of snow made it impossible for him to walk away without leaving footprints, which would lead to his detection. This risk, however, was obviated by the foresight of Emma, who carried her lover across the courtyard of the palace; a scene which was witnessed by Charlemagne, who next morning narrated the occurrence to his counsellors, and asked for their advice. Very severe punishments were suggested for the clandestine lover, but the emperor rewarded the devotion of the pair by consenting to their marriage. This story is, of course, improbable, and is further discredited by the fact that Einhard does not mention Emma among the number of Charlemagne's children. Moreover, a similar story has been told of a daughter of the emperor Henry III. It is uncertain whether Einhard had any children. He addressed a letter to a person named Vussin, whom he calls fili and mi nate, but, as Vussin is not mentioned in documents in which his interests as Einhard's son would have been concerned, it is possible that he was only a young man in whom he took a special interest. In January 815 the emperor Louis I bestowed on Einhard and his wife the domains of Michelstadt and Mulinheim in the Odenwald, and in the charter conveying these lands he is called simply Einhardus, but, in a document dated the 2nd of June of the same year, he is referred to as abbot. After this time he is mentioned as head of several monasteries: St. Peter, Mount Blandin and St. Bavon at Ghent, St. Servais at Maastricht, St. Cloud near Paris, and Fontenelle near Rouen, and he also had charge of the church of St. John the Baptist at Pavia. During the quarrels which took place between Louis I and his sons, in consequence of the emperor's second marriage, Einhard's efforts were directed to making peace, but after a time he grew tired of the troubles and intrigues of court life. In 818 he had given his estate at Michelstadt to the abbey of Lorsch, but he retained Mulinheim, where about 827 he founded an abbey and erected a church, to which he transported some relics of St. Peter and St. Marcellinus, which he had procured from Rome. To Mulinheim, which was afterwards called Seligenstadt, he finally retired in 830. His wife, who had been his constant helper, and whom he had not put away on becoming an abbot, died in 836, and after receiving a visit from the emperor, Einhard died on the 14th of March 840. He was buried at Seligenstadt, and his epitaph was written by Rabanus Maurus. Einhard was a man of very short stature, a feature on which Alcuin wrote an epigram. Consequently he was called Nardulus, a diminutive form of Einhardus, and his great industry and activity caused him to be likened to an ant. He was also a man of learning and culture. 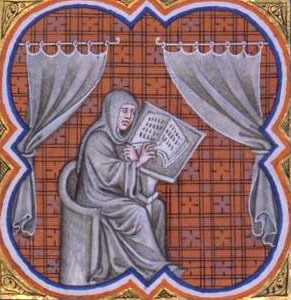 Reaping the benefits of the revival of learning brought about by Charlemagne, he was on intimate terms with Alcuin, was well versed in Latin literature, and knew some Greek. His most famous work is his Vita Karoli Magni, to which a prologue was added by Walafrid Strabo. Written in imitation of the De vitis Caesarum of Suetonius, this is the best contemporary account of the life of Charlemagne, and could only have been written by one who was very intimate with the emperor and his court. It is, moreover, a work of some artistic merit, although not free from inaccuracies. It was written before 821, and having been very popular during the middle ages, was first printed at Cologne in 1521. G. H. Pertz collated more than sixty manuscripts for his edition of 1829, and others have since come to light. Other works by Einhard are: Epistolae, which are of considerable importance for the history of the times; Historia translationis beatorum Christi martyrum Marcellini et Petri, which gives a curious account of how the bones of these martyrs were stolen and conveyed to Seligenstadt, and what miracles they wrought; and De adoranda cruce, a treatise which came to light in the 19th century, published by E. Dummler in Hanover, 1886. It has been asserted that Einhard was the author of some of the Frankish annals, and especially of part of the annals of Lorsch (Annales Laurissenses majores), and part of the annals of Fulda (Annales Fuldenses). Much discussion has taken place on this question, and several of the most eminent of German historians, Leopold von Ranke among them, have taken part therein, but no certain decision has been reached.